That wailing you hear is the MSM mourning the loss of one of their fav anti-Catholic memes. 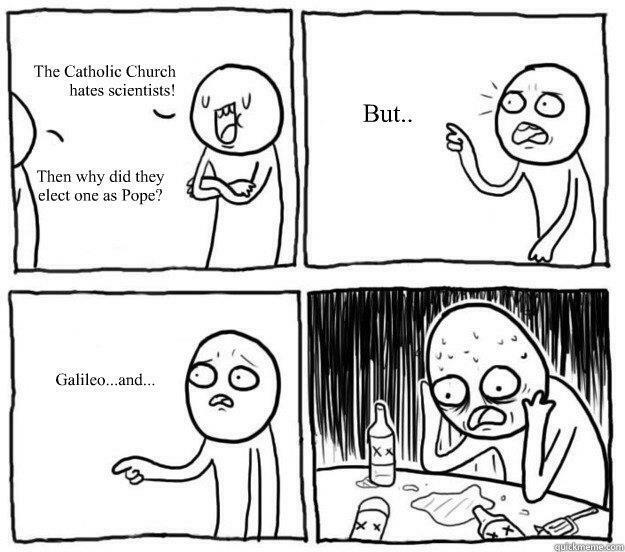 The first Jesuit pope? Well, yes, in a manner of speaking. Bergoglio is an old-school Jesuit, formed by classic Ignatian spirituality and deeply committed to an intelligent, sophisticated appropriation and proclamation of the full symphony of Catholic truth — qualities not notable for their prevalence among members of the Society of Jesus in the early 21st century. I suspect there were not all that many champagne corks flying last night in those Jesuit residences throughout the world where the Catholic Revolution That Never Was is still regarded as the ecclesiastical holy grail. For the shrewder of the new pope’s Jesuit brothers know full well that that dream was just dealt another severe blow [And may it be dealt many, many more in the coming months!]. And they perhaps fear that this pope, knowing the Society of Jesus and its contemporary confusions and corruptions as he does, just might take in hand the reform of the Jesuits that was one of the signal failures of the pontificate of John Paul II. Beware the Catholic Zombie Virus! NB. Below you will find a homily from 2010. This is my back-up homily in case I'm unable to finish the new one. The Spirit is having difficulty getting my cooperation for some reason. Brothers and sisters, I bring you some dramatic news this morning! Reports have come in from all over the world that the dead walk among us. They've been sighted in all the world's major cities, shambling around dressed like the living, doing the ordinary things that the living do. They are difficult to spot since their demeanor is easily confused with those who still cling to life. They go to work, eat their family meals; go to school, church, the grocery store. The media have given these deceased mimics a group name. They are called simply, “The Dead.” But since that label is rather boring, I've decided to refer to them as Zombies. So, yes, Zombies walk among us, and more specifically, Catholic Zombies walk among us and pray among us and go to communion with us. In fact, there are probably several right here this morning! Otherwise normal looking, normal sounding Catholics who shamble around in their living bodies without a living spirit. What animates them, what gives them the appearance of being alive is uncertain. What is certain is that they are truly dead, and that their bodies are a walking grave. What can be done for these poor spiritless creatures? They must be freed from what binds them to the grave; freed from the walking death of sin. In the story of Lazarus' resurrection, we have an abridged version of the Dummies Guide to Catholic Zombies. This handy guide helps us to identify, diagnose, and treat those who appear to be alive in Christ but are actually long dead to his spirit. A warning page 23 of the Guide calls our attention to an uncomfortable truth: “The Catholic Zombie virus is virulent and unpredictable. It can infect anyone at anytime. It attacks the Catholic's sin-immunity response system, replicating its viral disobedience-DNA and leaves the Spirit of Christ Defense Network incapable of properly responding to temptation. No one is immune. Even the holiest Catholic is susceptible to infection and re-infection.” As a start to the recovery process, the Guide refers both the infected and their care-givers to the story of Lazarus' resurrection and to Paul's short treatise on the relationship between the spiritually dead and Christ. These two passages make it clear that the truly living—those who live in Christ, body and soul—live b/c they dwell in the Lord's righteousness, believing wholeheartedly in the Lord when He says to them, “O my people, I will open your graves and have you rise from them. . .Then you shall know that I am the LORD, when I open your graves and have you rise from them, O my people!” Working backwards from cure to disease, the Guide reports that those most susceptible to infection by the Catholic Zombie virus are those who allow their Christ Defense Network to become weakened through inattention to personal prayer, the sacraments, good works, and holy reading. Working from disease to cure, we can see that the best treatment for the Zombie Catholic is personal prayer, the sacraments, good works, and holy reading. In other words, the best treatment is prevention. F1 holds a Masters in chemistry. Christ was sent and so are we. . . The inhabitants of Jerusalem are sure that Jesus can't be the Christ b/c they know where he is from. Why would knowing this bit of information make them so sure? Floating around at the time were several odd interpretations of the Messianic tradition from Isaiah, Micah, and the Psalms. The most prevalent myth about the Christ is summarized in the Letter to the Hebrews: the Messiah will come to the nations “without father, mother, or ancestry, without beginning of days or end of life”(7.3). The idea seemed to be that the Christ would be a divine being, and only a divine being; that is, there would be nothing at all human about the Son of God. But Jesus constantly refers to himself as both the Son of God and the Son of Man, human and divine. So, given their commitment to the odd-ball myths of who and what the Messiah would be, it's no wonder the inhabitants of Jerusalem dismissed Jesus out-of-hand. How did he respond to their dismissal? “You know me and also know where I am from. Yet I did not come on my own. . .” Jesus the Christ didn't come among us on his own. He was sent. And so are we. Let's make all the connections clear. The Father sent the Son to us and the Son sends us to the rest of the world. Who is this “us” who are sent to the world? In his response to the unbelieving citizens of Jerusalem, Jesus notes that they do not know the one who sent him. Since they do not know God the Father, how can they possibly know the Son? But if they were to come to know the Son, then they would know the Father. The “us” sent by Christ to the world are those of us who have come to know the Father through Christ. Know the Son, know the Father. How does this work? The Father and Son are one. And we are sent by the Son with the Holy Spirit to introduce the rest of the world to God's freely given mercy to sinners. The Father sends the Son to tell His sinful creatures that all of their sins are forgiven. The Son not only tells us that our sins are forgiven, he dies on the Cross to show us that the last sacrifice for our sins has been accomplished—once for all. But before he dies, the Son sends his disciples out into the world to shout the Good News: you are all free from your sins! Repent and receive God's mercy! Those same disciples send out their disciples and then those disciples send out their disciples and so on until we reach 2013 and now we're the disciples who are charged with shouting to the world the Good News of God's freely given mercy. The Son was sent, and so are we. We're sent into our homes, our schools, our places of work, the streets, the alleys, the malls, everywhere and anywhere a sinner might be, we are sent to anyone who might hear: you are no longer a slave to sin. Repent and receive God's mercy. Will we be thanked for delivering this message? Probably not. There are few souls out there who want to hear that they need anyone's mercy much less God's mercy. Instead they will say, “Let us beset the just one, because he is obnoxious to us; he sets himself against our doings, reproaches us for transgressions. . .He professes to have knowledge of God and styles himself a child of the Lord. . .He judges us debased.” With that reaction waiting for us, is it any wonder that we might hesitate to proclaim God's forgiveness? Let's be reminded that Jesus suffered and died for doing and saying what he was sent to do and say. And b/c he suffered and died in obedience to the Father's will, we are free from sin. The least we can do in gratitude for eternal life is to give the Good News to the world and welcome any who would hear it and repent. Sweep the stables, Holy Father! "The new Pope, the 76-year old Argentinean Jesuit, Jorge Mario Bergoglio, was Ratzinger’s main contender in the last Conclave. He is unusual in that he has always rejected posts in the Roman Curia and only visited the Vatican when it was absolutely necessary. One thing he hates to see in the clergy is 'spiritual worldliness': ecclesiastical careerism disguised as clerical refinement." Next to the sexual abuse scandals, ecclesiastical careerism is probably one of the most dangerous diseases infecting the Church. It gives birth to and nurtures secrets, lies, dysfunction, betrayal, wheeling-dealing, and factionalism. When your heart and mind are focused on advancing your career, you aren't watching the ecclesial bottom-line: preaching the Gospel. Of course, it's nothing new. It all started with James and John, the sons of Zebedee, and their ambitious mama. And there's really no way to cure this disease short of the Second Coming. However, a pope can certainly stem the tide against the infection by appointing people who are dedicated to serving the Church and not their own C.V.'s. The first step is sweep the stables! Send those who have been in power (directly or indirectly) away from Rome and appoint people who have no skin in the Vatican Game. In fact, appoint people who are ready, willing, and able to ask hard questions and demand answers. When the same names keep popping up year after year on the same lists of Vatican dicasteries, you know that things are getting stale and stalled. How can past mistakes be fixed if the people who made those mistakes won't admit that they made them b/c doing so would hurt their C.V.'s? God bless Pope Francis. . .he's got his work cut out for him. Retreat: "Call no one teacher. . ."
I'm giving a retreat for the administrators of the archdiocese's schools. Be back tomorrow (Fri) afternoon. Please keep us in prayer as we retreat into how we deepen our humility in service to the Church. Well, there's that. . . The one Jesuit who won't be lost during Holy Week! 1). The Protodeacon making the announcement needs to work on his timing/drama skills. He just blurted out the news! 2). Why wasn't the Holy Father wearing his papal stole? 3). Our Holy Father is a bit on the chunky side. . .Yea! JPII. . .BXVI. . .and now, F1. . .! But you probably know that already. . I was across the Lake at a Benedictine retreat center, celebrating Mass for the 8th grade girls of Mt Carmel Academy. I was vested and standing outside the chapel waiting for the girls to come over. . .when one of the bus drivers stated yelling: "White smoke! We have a Pope!" A second later, my cell beeped with a text msg from PopeAlarm. . . The driver called me over to the bus and we watched a live feed of the balcony for about ten minutes. By that time, I had to go in for Mass. After Mass, the driver called me over and said that they were just about to announce the new Pope. We listened. . .cheered. . .and I ran back over to the chapel and announced the news to the girls before they loaded into their buses. They clapped. I said to them, "First Latin American pope; first Jesuit pope; and the first pope named Francis. . .a day of firsts, ladies!" John Allen reports that Cardinal Bergoglio was second-runner up in the 2005 conclave. . . 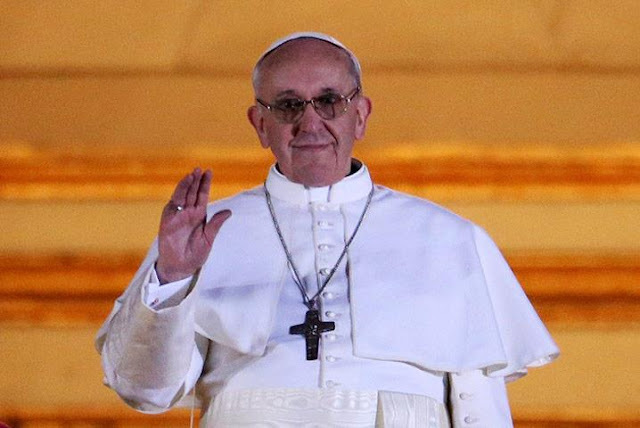 Anyway. . .God Bless our Holy Father, Pope Francis I! (Check the sidebar for the basic facts about F1). Everybody's buggin' me about my choice for Pope. 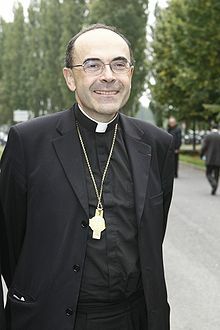 Cardinal Archbishop of Lyon, France. The actual healing of the royal official's son isn't all that dramatic. The sick boy is fifteen miles away in Capernaum. Jesus never lays eyes on him. He doesn't pray for the boy, lay hands on him, command an unclean spirit to depart from him. In fact, there is only one indication that Jesus does anything at all. The official says to Jesus, “Sir, come down before my child dies.” Jesus says to him, “You may go; your son will live.” That's it. “Your son will live” and the boy is healed. Fifteen miles away. Now, the next part of the story is rather dramatic. John writes, “The man believed what Jesus said to him and left.” The man believes. On what evidence? For what reason? He believes that his sick child has been healed simply b/c Jesus tells him so. This is interesting b/c Jesus' response to the official's initial request is: “Unless you people see signs and wonders, you will not believe.” Impatient with worry, the official then begs Jesus to hurry south. And then the long-distance healing is performed. The official neither sees nor hears a sign nor a wonder. Yet, he believes. He takes Jesus' word as true. The royal official believes that his son has been healed even before he sets out for home in Capernaum. His faith in Christ's report is confirmed by his slaves who meet him on the road. They report that the boy's fever broke at 1pm the day before. The moment Jesus said, “You may go; your son will live.” The drama of this story multiplies when we learn that “he and his whole household came to believe.” This seems like an odd comment to make. Didn't we say that the official already believed? Yes, but he believed Jesus' report that his son was healed. Now, with the testimony of his slaves, the official believes in Christ himself. And when the official tells the story of his visit with Jesus, his whole household comes to believe in Christ as well. This is how the faith is spread. 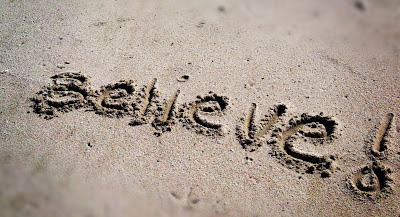 Believe on the word of Jesus. See his mighty deeds in your life. And then give witness to his words and deeds so that others might come to believe as well. Do we need to see signs and wonders in order to believe? Apparently not. The official's slaves knew that the boy was healed, but they didn't know that he had been healed by a word from Jesus. They believed on the testimony of their master. And b/c they believed, they too received a sign of eternal life through Christ. So, what are we to make of all this? One rather obvious point is that we do not need to run after signs and wonders to have our faith in Christ confirmed. Such unusual events may or may not happen from time to time, but one thing is clear: we don't need them in order to believe. We are called upon to believe the Gospel through the testimony of the apostles and by our innate desire to be perfected in God through Christ. When Christ speaks, his word either rings true or it doesn't. We are either transformed or we aren't. If his word rings true and we are transformed, then we are bound to give witness to his words and deeds and bring others into right relationship with God. In other words, we become the voices of Christ, speaking his word to the world. Just as the official gives witness to his slaves and brings his whole household to belief, so we too are compelled to testify to all that God has done for us. Speaking Christ's word into the headwinds of our culture is no casual task. But a raised voice won't drown out the white noise of ignorance and bigotry. What word speaks best of Christ? The Done Word. The Word as it is Done. If you live freely in mercy, then freely grant that same mercy to anyone in need. There is no better means to heal a soul than the judicious and lavish application of forgiveness. 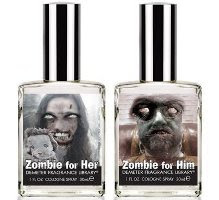 What perfume goes best with the Zombie Apocalypse? If you watch The Walking Dead--and I hope that you do--you know that one of the ways to walk among the Zombies w/o becoming lunch is to rub zombie guts all over you so that you smell like one of them. Well, thanks to fragrance producer, Demeter, you can skip the icky gut-smearing and just spritz on the stench of rotting flesh! Who doesn't like the idea of being a "new creation"? Just get rid of whatever's wrong-right-now and start over with everything-is-right. If you could be a new creation. . .say, you could plan this transformation, mark your calendar, and spend some leisure time contemplating the possibilities. . .what would you have changed? Of course, we're assuming here that there would be decisions to make. It's possible that the process of becoming wholly new would be completely out of our hands. But let's say that there are freely available options. What would you change? Would you go for the Aesthetics Package-buff bod, lithe grace, Olympian beauty? Maybe the Intellectual Package-genius IQ, quick wit, iron research discipline. Or perhaps the Holiness Package-true contrition, exemplary humility, perfect love. Can't decide? Well, we would probably have to spend some of our contemplation time figuring out what we need to change before deciding what we hope to become. The Prodigal Son contemplates his predicament in a foreign land and decides that home really is the best of all possible worlds. He decides to return to his family, repentant. Did his sins of dissipation get heavier as he approached the homestead? Did he even once think about being humiliated by a disgraceful return? What if his family sent him packing? If he held any doubts about going back to Dear Ole Dad, he didn't let them get in the way of his redemption. Imagine that as he approaches his father's farm, he becomes more beautiful, truer, better. With each step, he grows heavier in holiness. . .until his life of dissipation is itself dissipated by his humble desire for forgiveness. By the time he reaches the front door, all he needs is a word from his father. . .and he is a New Creation. Yesterday, I got an opportunity to meet one of the more public voices of Catholic intellectualism, George Weigel, whose new book Evangelical Catholicism: Deep Reform in the 21st-Century Church I’m presently reading. If John Thavis’ The Vatican Diaries is a must-read for journalists hoping to understand what they see at this conclave (and it is), Weigel’s book is key to understanding the long view of the crossroads at which the Catholic Church finds itself. While most believe that the transformation of the church came during the Vatican II council in the 1960s, Weigel points back to more than 90 years before, when Pope Leo XIII brought a new vitality and relevance to Catholicism, of which Vatican II was another step. Morrissey's post contains a video interview with Weigel. Highly recommended. I'm reading Evangelical Catholicism right now. I strongly urge you to get a copy and read it. 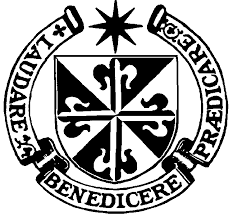 As a community here at St Dominic Priory, we read and discussed chapter four of the book and the friars were energized by Weigel's diagnosis of the Church's current ills. Is just being too much? NB. Deacons preaching this weekend. Below is a Roman homily that I've never actually preached. The readings are from Year B, I think (2009). Have you given much thought to the difference it would make in your self-understanding if you chose to believe that you are a cosmic accident rather than a created being? Assuming, of course, that you think of yourself as a creature—a wholly made person, made by a Maker—a creature gifted with not only biological life but an immortal soul made for life eternal; assuming you think of yourself in this way, how different would your life be if you decided this afternoon to believe that you are nothing more than the fortunate consequence of cosmic circumstance, an admittedly freakish development wrought from chance chemical reactions, advantageous climatic conditions, aggressive genetic survival, and the heir to all the fortunes an opposable thumb gives this world’s more advanced primates? Would you think, for instance, that this world, this universe needs you? Needs us? Would we have any reason at all to believe that we are any more necessary to the other biological accidents of this planet than if we believe ourselves to be creatures made for a purpose? I would say, we would have less reason to believe ourselves necessary, fewer good reasons for thinking ourselves particularly important. Accidents are accidents; by definition, random clashes of things tossed at one another by chance in circumstance. If you don’t think of yourself as an accident, what difference does it make to you then to read Paul writing to the Ephesians: “. . .we are [God’s] handiwork, created in Christ Jesus for the good works that God has prepared in advance, that we should live in them”? The great German poet, Rainer M. Rilke, in what is arguably the greatest modern elegy, the “Ninth Elegy” of his Dunio Elegies, asks my question this way: “Why, if this interval of being can be spent serenely/in the form of a laurel[…]: why then/have to be human—and, escaping from fate,/keeping longing for fate?...” His question is not an easy one; however, rather pointedly, Rilke is asking: since we have escaped fate by being human—our human choices design our futures not fate—, why continue to long for fate, for destiny? Why do we yearn for a purpose, a story already written out for us? He says, “Oh not because happiness exists,/[…]But because truly being here is so much; because everything here/apparently needs us, this fleeting world, which in some strange way/keeps calling to us. Us, the most fleeting of all.” Fleeting though we are, we are gifted with the use of words. Rilke argues that the ungifted things of this world need us to say the unsayable, to name those things that cannot name themselves, and not only name them but praise them as well, and in praising them, change them: “[…] transient,/they look to us for deliverance: us, the most transient of all./They want us to change them, utterly, in our invisible heart,/within—oh endlessly—within us! Whoever we may be at last.” Whoever we may be at last. . .
Who are we, at last? Paul says that we are God’s handiwork. This is who we are now and at last. Rilke tells us that “truly being here is so much.” And he is right. Truly being is so much. Too much, perhaps. Just being here is overwhelming—even as rational animals crafted to live immortally and knowing it to be so—simply being so, no more than being so, just this one thing right now, this can be too much. Forget doing. Forget thinking. Forget past and future. Just being exactly who and what we are—just being this here—can be too much. Being God’s handiwork, being made, created in Christ Jesus. . .each one of us composed, molded, drawn, built; from nothing, generated and blessed with breath and memory and intellect and will. And why? Why are we made? To name our inanimate cousins in creation? No. To take them into ourselves and change them? No. To propagate our DNA like herd animals, breeding like livestock? No. None of these is too much. None of these is truly being. Why, then? Paul writes, “God, who is rich in mercy, because of the great love he had for us [. . .] brought us to life with Christ [. . .] that in the ages to come He might show the immeasurable riches of his grace in his kindness to us in Christ Jesus.” We were brought to life in Christ so that our Father might show us His infinite kindness through Christ. We were created in love for no other reason than to be loved. And we know that are loved by Love Himself when He shows us “the immeasurable riches of his grace in kindness…” The oft-repeated and much-loved gospel reading says this perfectly: “For God so loved the world that he gave his only Son, so that everyone who believes in him might not perish but might have eternal life.” The ultimate demonstration of the Father’s infinite mercy, His immeasurable kindness. . .is His Son dying on a cross—a death that gave us birth to a new life in Christ. Prophecy and history meet to fulfill God’s will. That was no accident, no random clash of free-floating events! So, if you don’t think of yourself as an accident, what difference does it make to you then that you are a creature created in love by Love? At the very least, you must think of yourself as the recipient of a divine gift; not only life itself, but every good thing that can given to one who lives faithfully in Christ. Read Paul again: “. . .we are [God’s] handiwork, created in Christ Jesus FOR the good works that God has prepared in advance, THAT we should live in them.” We are creatures created for the good works of Christ so that we should live in these good works. Do you live in the good works of Christ? If you do, then you do not live an accidental life, a life of chance, but rather a life of truth, as Jesus teaches us, “…whoever lives the truth comes to the light, so that his works may be clearly seen as done in God.” Live in the good works of Christ, do these same good works, and your good works are seen as holy works done by God’s will. Notice, however, what happens when someone begins to think of himself as the product of random processes. Paul says that we are created in Christ Jesus to live in his good works. But if you hold that you are a product rather than a creature, then you will not acknowledge Christ or the good works you were created to use and imitate. Jesus says, “Whoever believes in [Christ] will not be condemned, but whoever does not believe has already been condemned…” Already been condemned. How so? Random products of natural processes have no purpose, no end. Random products are not good, true, or beautiful. They just are. They cannot truly be as beings loved by a Lover. For them, there is no Lover. No love. 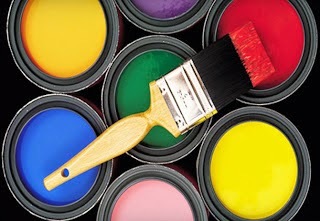 Random products can feel passion, think rational thoughts, enjoy art, literature, and music. But can they do truly Good Things if they will not acknowledge they are the handiwork of Goodness Himself? To what—beyond their chanced, mechanical lives—does the true, the good, and the beautiful refer? What can love be but the pre-determined firing of neurons in the proper sequence to produce the physiological effect most often labeled “love”? Is this condemnation? Yes, of a sort. Life in Christ is life lived knowing you are living out a divinely-gifted purpose. Life without Christ is life lived knowing you are living until your body parts fail you—a very limited warranty indeed.